Being organized can be a difficult chore for an artist. Creating work is “the thing”, and everything else can seem to be just details. However, keeping track of what you make and where it goes is an important part of being an artist. Up until now, I kept log-books of all my firings, file drawers with info on my gallery contacts and sales, email directories of communications with customers and galleries, and directories of photos of my work. But, I did not have any kind of database that kept track of sales and consignments… until now. I have experimented with about 8 different programs, read reviews, and even used one for several months – but was very unhappy with all of them – until now. The others were needlessly complex, non-intuitive, graphically outdated, and attempted to fulfill the needs of a gallery as well as an artist. Fortunately, my searches brought me to a web based program called Artwork Archive. Justin Anthony, along with his business partner John Feustel, just launched a small, scrappy Denver-based startup in the River North Art District that we think artists will find interesting. The duo have worked with artists of all types and locations over the last few months to create a tool that addresses the needs of the modern-day artist. It’s the first cloud-based tool of its type to help artists track pieces, galleries, sales, competitions, contacts, limited edition runs and more — allowing creative souls to intelligently manage and market your work. With this software, data is kept “in the cloud”. This obviously has its pros and cons. The pros, are that the software can be changed/improved/updated by the developer instantly without any need for the user to upgrade the software, the database is backed up daily (who among us does that ourselves? ), and that your information can be securely accessed from any computer, laptop, iPhone, iPad – not just the one on which you entered the data. My main concern with this concept was that after putting much time and effort in creating and maintaining the database – that the company might go out of business. I wrote to the developer, after trying the software out, and raised my concern about this. His response was that he has many friends using the service, he is making money, and is growing his client base. They are hiring more staff, and feel that it is already a successful venture. Considering that even software that you purchase can become obsolete or non-supported, I suppose we have to always have that concern with any program – cloud based or not. In addition, each section of the database does have the ability to export the data in a CSV format, so one could keep their own backup of the raw data and view it as a spreadsheet. The cost of this service is something to consider. You can try it and enter up to 10 pieces of artwork and 2 galleries for free; for $39/year you can enter 100 pieces and 10 galleries; and for $79/year you can enter unlimited amounts of artwork and galleries. After the free trial, I opted for the unlimited plan, since I had over 10 years of catching up to do with my organizing. But, if you are just starting with this the $39/yr plan might work fine for quite a while. In comparison, database software that you purchase ranges from $45-1200 initially, and of course there will be periodic charges for updates. The site has a very nice graphic interface, and (opposed to the other programs I tried) is actually a pleasure to use. You individually enter each piece of art, each gallery, and each contact (private buyer). Once a piece is entered into the system, you can indicate if it is at a gallery, in the Artist’s Inventory, or sold. Additions or changes to anything is easy. You are able to attach an image (up to 5MB) to the artwork, and add detail images as well. When you do this the image is uploaded to their server. This compares favorably to those programs that link to an image on your hard drive. If you move or rename the images (or rename the hard drive, or get a new computer) the link is lost, and you have to re-attach an image. This is how an individual artwork page will look in this program. It is very easy to look and see which pieces are at which gallery, how much each gallery has sold, and what you still have in your own inventory. In addition, it has a “Reporting” section which gives you information like the value of all the pieces entered into the database, the value of sold work, value of work created and sold in the last 12 months, data on the total value of your work at each gallery, and a map with a graphic representation of how many pieces reside at each gallery. Very slick! The program has the ability to print out a “Portfolio Page” of each piece as a PDF including an image and pertinent details about the piece(example on the left). It will also print out consignment reports, gallery labels, invoices, and address labels. I have not tried out all these printing functions, but I suspect they can be very useful. 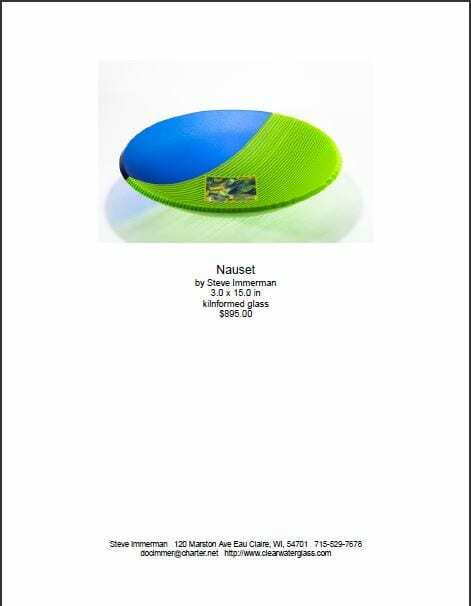 As a matter of fact, I started sending consignment reports to my galleries to see if their inventory matched my report. In the process, one of my galleries realized that they had forgotten to pay me for a piece that sold almost two years ago! They immediately forwarded me a check, and I feel like I’ve paid for the next 10 years of using the program. 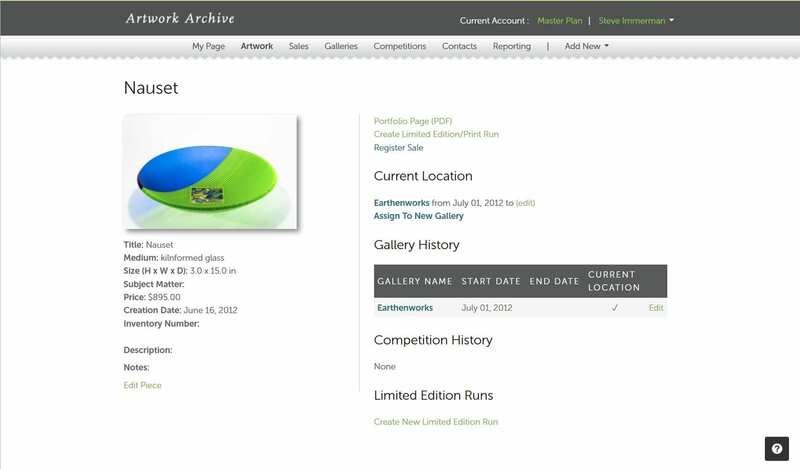 When entering data on an individual piece of artwork, there are fields for the name, collection (series), dimensions, inventory number, medium, subject matter, creation date, price, and large open fields to put a description and notes. I have not, but I imagine one could, put details regarding the layup, construction, firing, and finishing of the piece. 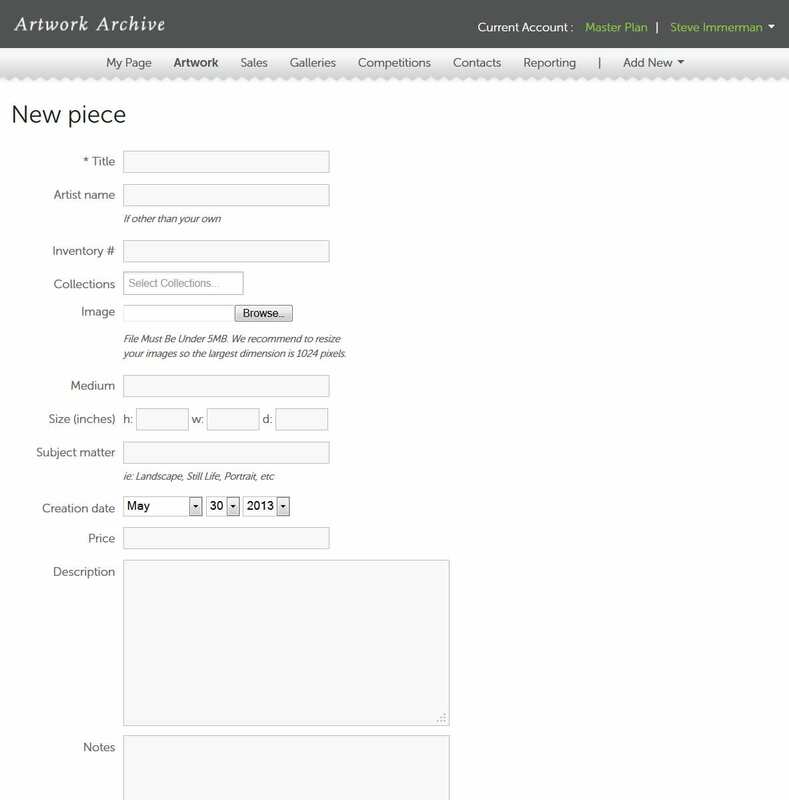 This is an is an image of a page with fields to enter the details of your artwork. The “Collections” field is where you can indicate your various “series” of work. Later, you can sort by “Collections” if need be. This can be very helpful in some situations. For example, just the other day I was approached about displaying my “Exposure Series” pieces at an airport. I could easily see all my Exposure pieces, which were sold, which were available, and where they were currently located. There is also a section on Competitions, where you can indicate which pieces were submitted to various competitions, what the deadlines are, and all the details of the competition. Navigation around the site is easy and intuitive, and there are links everywhere to get you to the page you want. Overall, this is an excellent program – and for me is well worth the cost. 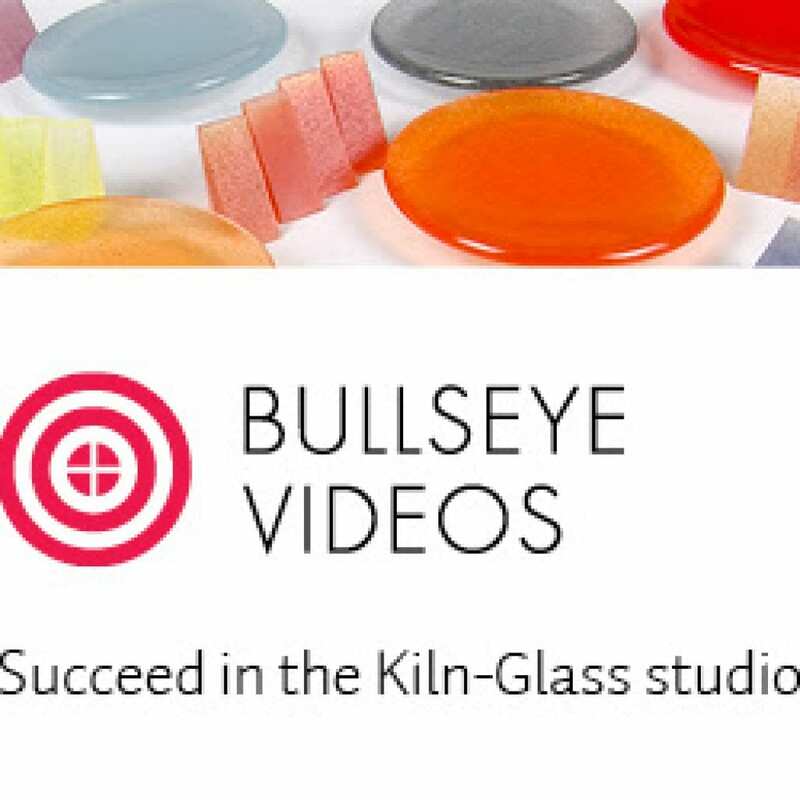 Whether you use this program, another program, or keep track of your work some other way – it is a necessary part of being a successful and organized artist. If you are looking for a way to organize your artwork, this is the best option I’ve come across. Click here to see another review of Artwork Archive. Note: I have no connection to Artwork Archive other than being an enthusiastic user. 2018 Update: this program continues to be incredibly useful, and has had several updates since 2013 that make it better and better.